Staying well-nourished with cancer-related fatigue. Meal planning, grocery shopping, food preparation and even eating all require energy – something many of our readers may be lacking. In this issue, we will provide you with strategies to keep yourself well-nourished when you are tired – it is very possible to do! Cancer-related fatigue is the most common and often the most distressing side effect experienced by people with cancer. It is different from the fatigue everyone has from time to time; it is usually more severe, lasts longer, and can take a heavy toll on your quality of life. Resting more or doing less does not make it go away. Food provides our body with energy, like fuel does for a car. Eating every few hours throughout the day gives your body a constant source of energy and helps to maintain blood sugar levels. Including a source of protein (fish, poultry, dairy foods, nuts, legumes, eggs, meat) with all meals and snacks is also important in keeping energy at an even level, and in reducing muscle loss. The Guide to Healthy eating has some helpful ideas on how to include protein in a meal. CONSIDER FRESH, FROZEN, OR CANNED FOODS AS NUTRITIOUS AND CONVENIENT OPTIONS. Not drinking enough fluids increases fatigue. Most people need eight cups (2 litres) of fluid each day. Fluid is anything that is liquid at room temperature and can include water, juice, milk, smoothies, soup, broth, sports drinks, popsicles, flavoured gelatin, ice cream or herbal tea. You may want to speak with a dietitian specializing in cancer regarding your specific fluid requirements and what liquids are best for you. Getting balanced nutrition doesn’t have to be complicated or time-consuming. Aim to include foods from at least three food groups at each meal. 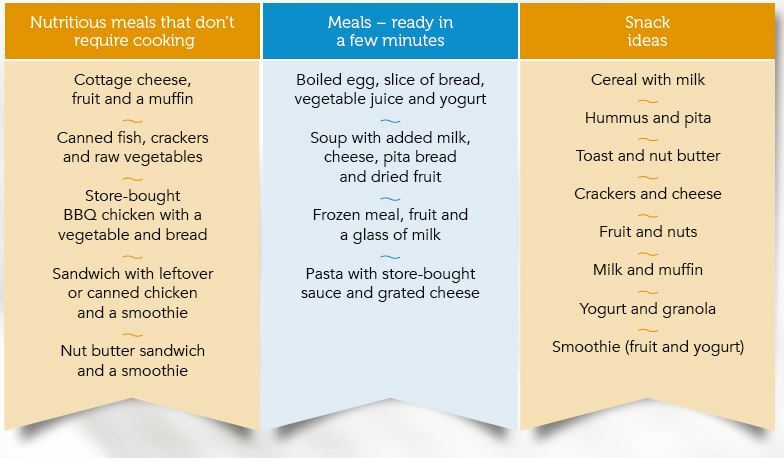 Plan every snack to include a minimum of two food groups (see table below). Why not try some store-bought, already prepared foods if you just don’t feel like making anything yourself? And here are some more ideas. You may want to eat breakfast food at night. Or use your microwave more often to prepare meals or snacks. Have leftovers from the meal before. Prepare a larger batch of food than you need and eat it in portions. Allow yourself to do the unusual if this helps you eat. We realize preparing meals from scratch every day isn’t very realistic. Give yourself permission to take some shortcuts. Stocking your pantry, refrigerator and freezer with convenience items is a great way to help you meet your nutritional needs and conserve energy. Frozen meals, canned fish or poultry, instant oatmeal, packaged nuts or seeds and nutritional supplements (drinks) can provide good nutrition when you need something quick and effortless. 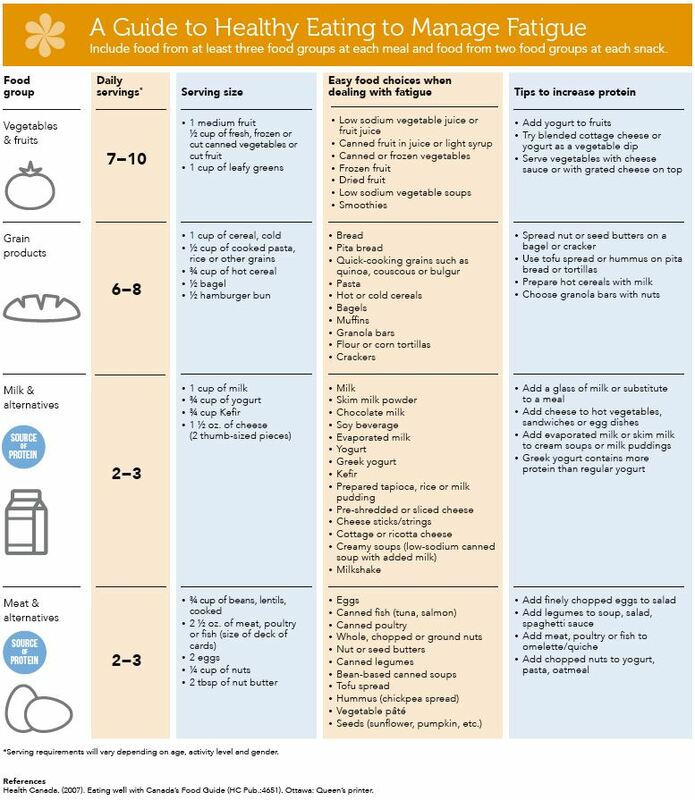 Check out our suggestions for meals and snacks on the chart above. Combine a few simple ingredients like milk or soy beverage, nuts and fruits in a blender and make a quick meal or snack. When shopping for convenience foods such as frozen meals, check the labels and try to choose the products with lower sodium and saturated fat and higher protein content. Complete your meal with a glass of milk, a slice of cheese, a Greek yogurt, or a handful of nuts to increase protein content. These “meals in a bottle” (such as Boost® and Resource® 2.0) provide all the essential nutrients and can be very handy. They can be used as a meal or snack alternative or taken in small amounts with medications to improve nutrition throughout the day. They are available in many flavours.